On December 13, 2013, it was announced that two contract amendments worth a total of $25 million were issued to DEW Engineering and Development ULC for the provision of an additional 99 baseline shelters. The Honourable Diane Finley, Minister of Public Works and Government Services, and the Honourable Rob Nicholson, P.C., Q.C., Minister of National Defence, announced a contract award to DEW Engineering and Development ULC, of Ottawa, for mobile workspaces under the Medium Support Vehicle System project. In August 2009, the Government of Canada awarded a $130 million competitive contract to DEW Engineering and Development ULC for the provision of 895 baseline shelters. That contract has been increased and a new competitive contract has also been awarded to DEW. The new contract and contract amendments are valued at $73.5 million. DEW Engineering and Development ULC will now be building an additional 99 shelters through a contract amendment valued at $25 million, in addition to the 895 previously ordered. Under a new competitive contract award, valued at $48.5 million, DEW will also design and “kit,” or equip, 846 of the shelters with such items as power generators, tools, work benches, and electronic and office equipment. The spaces can then be used as command posts, meteorological and medical stations and workshops. The building of the additional shelters and the kitting of the shelters will be done at the company’s Canadian facilities. These kitted shelters are part of National Defence’s Medium Support Vehicle System project, which is replacing and modernizing the army’s fleet of medium-weight trucks. This will help to ensure that the men and women of the Canadian Armed Forces have the ability to provide lift and logistical support on the ground in order to transport resources where they are most needed. 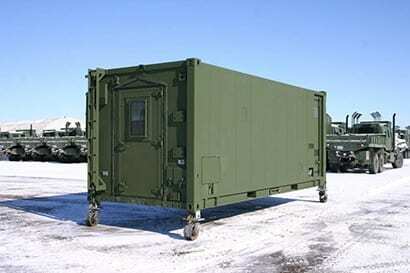 First deliveries of the kitted shelters are planned for the spring of 2014. The delivery of the last kitted shelter is planned for early 2017. May Sippley liked this on Facebook. Mighty Miramichi liked this on Facebook. Colleen Gorman liked this on Facebook.